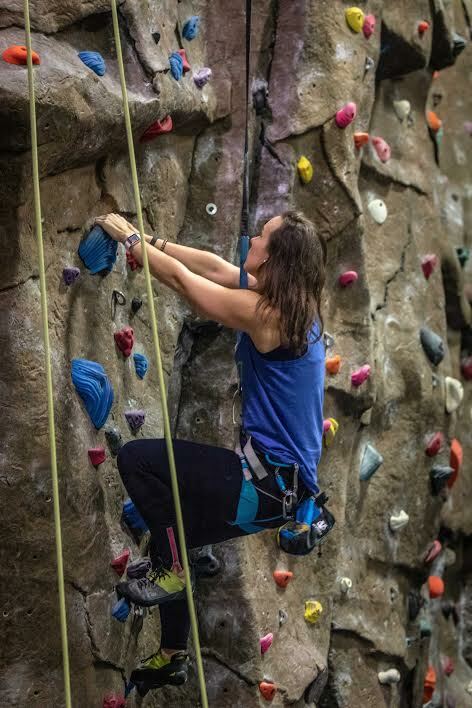 On the evening of Saturday December 15th, Randolph Climbing Center (RCC) hosted an event Climbing Beyond Cancer to fundraise for the organization Epic Experience. Epic Experience provides free week-long adventure experiences to adults who have been diagnosed with cancer. “Most organizations that existed at the time when Epic Experience was founded focused on kids or young adults. Epic Experience is the only one who does adults and all stages of Cancer, both those currently in treatment and survivors,” says Sabine Schwab, who organized the event. Schwab, 36, of Roxbury, was diagnosed with brain cancer in 2014 at age 32, shortly after giving birth to her daughter. Her tumor was about the size of a golf ball. “I had open brain surgery, six weeks of daily radiation, and a year of chemotherapy,” says Schwab. She is a brain cancer survivor of almost five years now and devotes much of her time volunteering. “I have dedicated my life to the cancer community. I serve on various boards, and I’m a speaker and advocate in the brain tumor community,” says Schwab. Schwab attended an Epic Experience camp in May 2015. Schwab’s experience brought her white water rafting on the Colorado River, among other activities. “It’s not just the adventures that bring the healing,” says Schwab, “they also make time for group discussions with commonly shared fears and questions along the cancer journey.” Schwab joined the Alumni Board of Epic Experience as an Outreach Specialist in June 2015. In 2017, she became the Alumni Team lead, and in 2018 joined the Board of Directors. Schwab enjoys climbing at Randolph Climbing Center and thought it would be the perfect place to fundraise for Epic Experience. Joe Auriemma III, one of the managers and the event coordinator of Randolph Climbing Center, says that they are one of the great kept secrets of the local climbing community. The Epic Experience event was the first fundraising event at RCC. Now, “we are looking for more groups to do benefit events in partnership with us,” says Auriemma. Tickets for Climbing Beyond Cancer cost $25, which included climbing gear and instructors. The first 20 people who bought a ticket were entered into a raffle for a free month-long membership to RCC. The event raised $1,006 for Epic Experience, and RCC has committed to hosting another event with the organization in the upcoming months. At the event, participants enjoyed top-rope climbing and bouldering. Attendees ranged from first-timers to seasoned climbers. Schwab even provided a free babysitter and set up crafts and treats in the party room where parents could drop off their kids. They could then go enjoy a date night of climbing. Randolph Climbing Center is located at 3 Middlebury Blvd in Randolph. For information about future events at RCC, visit Randolph Climbing Center on Facebook or Instagram.